Are you ready for your next adventure? Our mission at Fort Fiat is to take you on an adventure through Christ’s gift of life with the one, true Catholic faith; our adventure of living life to the full, glorifying Christ and with the goal of Heaven in mind. What is “fiat?” Fiat, by latin definition, means “let it be done.” Together we are forming an initiative to be the apostles of today that God wills for each one of us. It is our joyful decree to the world, and through the grace and glory of God, it can and will be done. I hope you can let this small step to sanctity be your own fiat. 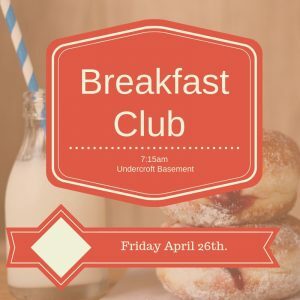 Upcoming Breakfast Clubs – Anyone is welcome to attend our monthly breakfasts, junior high or high school, non-youth group students or parents. Hope to see new faces each month! These are held at 7:15am in the new undercroft basement @ MHC! January 28th, February 15th, March 14th (Thursday), and April 26th & May 17th. Youth Group Discipleship Nights – Wednesdays starting September 5th, 2018 will be a youth group night with the High school 9:00-10:00pm. Open to all HS students. Small Groups – HS Ladies Small groups meet in the youth room at MHC (door left of the garages) lower classmen meet on Sundays 9:00pm and upperclassmen meet on Thursdays 7:00am. 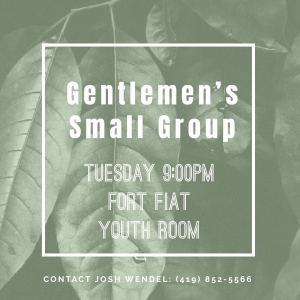 HS Men’s group meet every Tuesday night 9:00pm with Josh Wendel & Fr. Matt in the youth room. 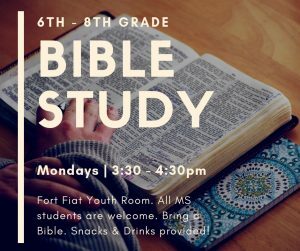 MS Bible Study – All 6th – 8th graders are welcome to our Monday Bible Study from 3:30 – 4:30pm! The youth will be learning a beginners guide to the bible, salvation history, how to pray with the gospels, and personalizing the teachings of Jesus Christ to their own lives! Fun snacks & games follow. 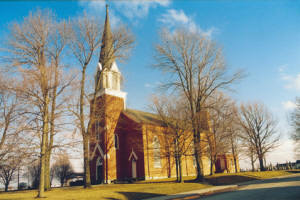 Stations of the Cross – Join us during lent for Stations of the Cross! Begins March 8th, 3:30pm @MHC with benediction. We need about 3 students to help serve during the stations. Please sign up through Carly! Afterwards, soup and supper will be in the undercroft. Families can also sign up each week to bring your favorite lenten soups! 2019 Summer Mission Trips – Fort Fiat will have three wonderful opportunities for incoming HS students to encounter Jesus and learn how to share is gospel through works of service, world class speakers, and discipleship training. Here’s a brief description of each trip. Contact Carly for registration information. 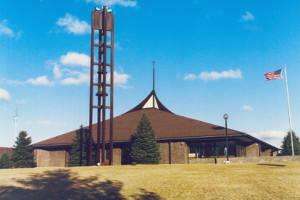 Catholic Heart Work Camp (CHWC): Denver June 16 – 22nd. Week long service work trip. 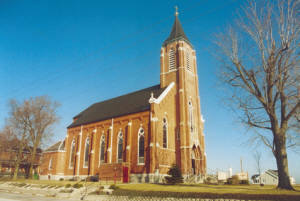 Youth will be serving the poor by helping impoverish communities rebuild homes, side walks, and serve in soup kitchens. At the end of each work day, each group will reflect on bible messages from that day followed by Mass and worship music. Steubenville Youth Conference: Steubenville, Ohio July 19-21st. Ideal for incoming freshmen-outgoing sophomores. Weekend long conference with speakers like Fr. 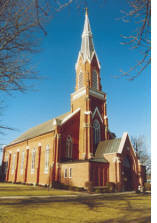 Mike Schmitz, Fr. Leo Patalinghug, Jackie Francois, ect. Teens who are interested in the Gospel and need that one last invitation to “jump in,” along with teens who need to re-commit. As we search for ways to escape these feelings of isolation, there comes a small, quiet whisper that pierces through to the depths of our heart: “You are never alone, because you are Mine.” This summer, over 50,000 Catholic teens across North America will attend one of 24 Steubenville Youth Conferences to encounter the God who calls us His sons and daughters. Come and experience His overwhelming love for you. You belong here. Here are some more great resources to help you learn more! Catholic podcasts for the Family!